The AG-AC120 is a budget version of the AG-AC130 and it does not include an EVF, battery and some accessories. 50i/50p: 1/50, 1/60, 1/120, 1/250, 1/500, 1/1000, 1/2000 sec. 25p: 1/25, 1/50, 1/60, 1/120, 1/250, 1/500, 1/1000, 1/2000 sec. 50i/50p: 1/6 sec., 1/12 sec., 1/25 sec. 25p : 1/6 sec., 1/12 sec. 50i/50p: 1/50.0 sec. to 1/250.0 sec. 25p: 1/25.0 sec. to 1/250.0 sec. Awesome Audio and Video Recording. Really very good performance. I like it. very nice panasonic 120.stage programme and wedding programme audio and video supper clarity. 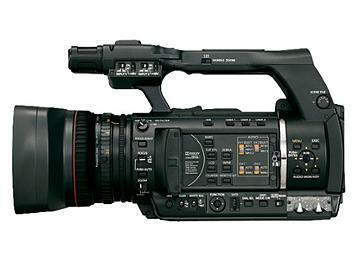 I like thise hd video camera . Recordin is veri good quelity and low liting fithet very good. It was well packed and camcorder works very fine. La qualité du tri-capteur est excellente. Toutes les fonctions auto/manuel selon le besoin. La mise au point un peu lente dans la pénombre. Rapport qualité/prix est imbattable. Livré en Europe en 3 jours ! good excellent for wedding & event videography work. for wedding parpas to good camera. but add points to 60/p or indian pal ver. skin tone xmor. loos poins is wide full hd shoot day light so watch little bit blur the image of video cheak it? Best HD Camera For Wedding. Best Fertures with lowlight Rec & Excellent DV Format Suppotted & HD too....Nice One.. I use it for concerts and event video and I am overall very happy with the camera. I combine it with a Atomos ninja (via the HDMI-out) for 4:2:2 10bit resolution of the videosignal. The sound module is great with true pro-mics like Sennheiser MKH och Pearl PML MS mic. Focus can be assisted with a function (Focus Assist) or be automatic. in low light I have notices that the auto-function is a bit tricky, but the manaual focus-ring is easy to reach and there is also a remote-connection for use with for instance Vari-ZOOM (Do not buy LANC-controller, doesnt work, must be a Panasonic-specific controller). I regularily find faults and defects with most any equipment I buy, but we bought 3 AC120 cameras, and I have to say I am constantly reminded by how great these cameras are. We've already used them more than I thought, and they've just performed like any camera 3-4 times the price. I cannot recommend these enough. If you do multiple-camera jobs like weddings, concerts, events and thelike, buy 3 of these. Remember the codec is demanding, so you should probably have a quite new and powerful computer.